Process Playground is an online application designed to help you build and simulate your process models. 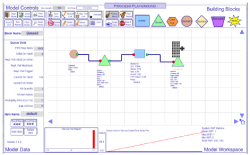 Built for process improvement and process design professionals, Process Playground delivers an easy-to-learn, easy-to-use, and easy-to-install Web-based simulator at an affordable price. Process Playground is a Web-based discrete event simulation program that allows you to create virtual models of your processes. Traditional simulation programs take a "boil-the-ocean" approach by adding so much complexity that you can model almost every nuance of any process, but they neglect the common, simple functions like pull systems. The result is often a long and expensive learning curve before you can build the models you need. We've taken a simpler approach for Process Playground. It includes only the tools you need to model the typical processes found in a continuous improvement project. To run Process Playground, you simply log in to the online portal and begin to draw out your process map using the model building tools found at the top of the browser. There are no hidden menus or dialog boxes - everything you can do is right there on the screen. The model controls are simple and organized into three sections: management tools, model building tools, and model running tools. We include 13 training videos that walk you through the building of twelve, successively more difficult models. Can my process handle an increase or decrease in demand level? What will happen if there is variation in demand or if service time changes? If need to improve the lead time of the process, what should I change first? You can view the simulation results in charts and tables and export the data for review or further analysis in other software programs. You can save your work to your local storage and then launch it again using Process Playground. What if you're starting from scratch and creating a brand new process? Simulating the new process map with Process Playground will allow you to perform an infinite variety of virtual pilot runs before you even begin to commit resources to the new process. You can test the new process against large ranges of demand and variation, and experiment with various failure modes before they happen. Imagine a Failure Mode and Effects Analysis that is 90% complete before the first live pilot! Because Process Playground is Web-based, you never need to worry about installation, updates or compatibility. The program runs in any Web browser that supports Adobe Flash Player version 10.1 or higher. The model files are also very small (typically less than 100 kilobytes), so they are easy to share as well. The ability to quickly simulate complex processes, product mixes and patterns. You can learn and practice every feature and function in a single eight-hour session. The program stores model files locally on your computer, so you have complete control over them. You can use it as a teaching aid for experimentation and for demonstrating the concepts of simulation. The program is a low-cost, Web-deployed solution specifically designed for Lean Six Sigma processes. Process Playground is licensed at $500 for a single-user, one-year subscription. Process Playground is also included in our Design for Six Sigma courses and our Master Black Belt development program. We offer enterprise-wide licenses of Process Playground. Pricing is based on the total number of your employees, with significant discounts available for large organizations. For Process Playground product support, please visit our contact page, and complete and submit the form for the topic "Technical Support". How do I get a copy of Process Playground? Process Playground is delivered to you entirely via the internet. Unlike other process simulation tools, Process Playground is entirely online, with nothing to install on your machine, so you can access it from any computer. Once you register for a trial or purchase a license, you receive login information for the online "course" from which you can launch the tool. How do I learn Process Playground? The Process Playground course includes everything you need to begin to learn and use the tool. This includes the instruction manual, video tutorials, and example models. Are there training courses that use Process Playground? Yes. So far, we have included Process Playground in our Design for Six Sigma courses and our Master Black Belt development program.